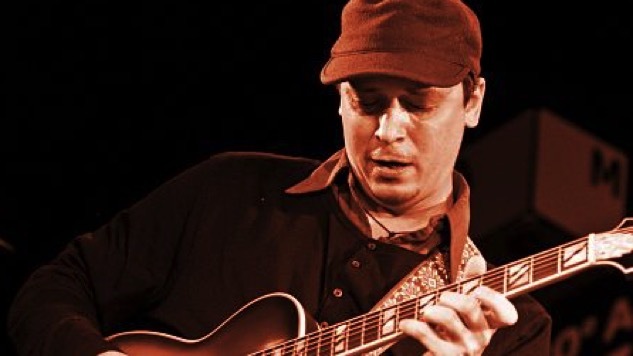 Over the past few years, American emigre Kurt Rosenwinkel, one of the most influential and strikingly original guitarist-composers of his generation, meticulously worked on his new album Caipi (short for Caiparihna) for his new label, Heartcore Records, at his home studio in Berlin. Rosenwinkel played virtually all of the instruments himself on Caipi, in classic Stevie Wonder-Prince fashion, then fielded a band, including Brazilian players Frederico Heliodoro (bass), Pedro Martins (guitar-vocals), and Antonio Loureiro (percussion-vocals), to perform the music live. Following two weeks of intensive rehearsals in Berlin, Rosenwinkel premiered his new Caipi Band in a week-long engagement at Birdland from March 14-18. What was immediately apparent about Rosenwinkel’s latest project was the heavy emphasis on vocals. Whereas his past outings were strictly instrumental and showcased his remarkably fluid guitar work in trio and quartet settings, his new Caipi band features rich five-part harmonies with the guitarist simultaneously playing his signature legato guitar lines while singing into a headset mic. The music has an alluring Brazilian undercurrent, with several of the songs sung in Portuguese, and contains an uplifting sweep that is positively infectious. With this album, Rosenwinkel has made a conceptual leap not unlike what Pat Metheny did in going from his American Garage quartet to his larger-scale and Brazilian-tinged Travels and Still Life (Talking) ensembles. For the seventh annual Alternative Guitar Summit, held at Le Poisson Rouge on March 10, curator Joel Harrison corralled a wide-ranging group of fellow guitarists to celebrate the music of the hugely influential guitarist-composer Pat Metheny as part of the “While We’re Still Here” tribute series. Hearing Metheny’s music performed by a variety of guitarists—from Nir Felder to Camila Meza, Mike Moreno, Rez Abbasi, Liberty Ellman, Miles Okazaki, Nels Cline, and Harrison himself—was a reminder of the enormous range of Metheny’s oeuvre spanning 40 years and just how profound his impact has been on two generations of players. Surprise guest Bill Frisell opened the evening with an intimate solo reading of Metheny’s luminous “Sirabhorn,” from 1976’s Bright Size Life. Folder conjured up the delicious delicacy of Metheny’s haunting ballad “Unity Village” (from Bright Size Life) and acquitted himself with exquisite chops on the swinging “H&H” (from 1990’s Question and Answer). Harrison’s String Choir (two guitars and string quartet) emphasized the folksy Americana elements inherent in Metheny’s “Last Train Home” (from 1987’s Still Life (Talking) and “Heartland” (from 1979’s American Garage), which had Harrison playing slide on a dobro guitar. Chilean guitarist and singer Meza, in duet with pianist James Francies, doubled the ebullient line of “Have You Heard” (from 1989’s Letter From Home) on wordless vocals and guitar and drew a standing ovation for her passionate reading of “Dream of the Return” (also from Letter From Home), which had her delivering Pedro Aznar’s Spanish lyrics in mellifluous fashion. Moreno acknowledged the Metheny’s presence in the audience by saying, “Playing ‘Bright Size Life’ for Pat is like playing ‘Purple Haze’ for Jimi Hendrix.” His rendition of that chops-busting anthem, with Doug Weiss on bass and Kendrick Scott on drums, was charged with its own momentum, while the gorgeous ballad “Always and Forever” (from 1992’s Secret Story) carried a “Skylark” kind of melancholy and showcased Moreno’s uncommon lyricism and sensitivity. Abbasi put an Indian-flavored spin on “This Is Not America” (Metheny’s 1985 collaboration with David Bowie on the soundtrack to The Falcon and the Snowman) by emulating a sitar sound with fretless acoustic guitar, backed by Ben Stiver on keyboards and Sameer Gupta on tabla. Guitarists Liberty and Okazaki created swirling counter melodies on their lush interpretation of Methany’s hauntingly beautiful ballad “Kathelin Gray” (from 1985’s Song X, his provocative collaboration with free jazz legend Ornette Coleman). Their swinging rendition of “Question and Answer” (title track of Metheny’s 1989 trio album with Dave Holland and Roy Haynes) had them engaging in a flurry of interlocking single note lines. The jazz world lost a true guitar hero on Feb. 19 when Larry Coryell died in his sleep following a gig at the Iridium club in Midtown Manhattan. Dubbed the godfather of fusion, Coryell combined the influences of Chuck Berry and Wes Montgomery into a singular guitar voice that organically incorporated rock and jazz. Coryell arrived in New York City from Seattle in 1965 and quickly landed a spot in Chico Hamilton’s group, appearing on the drummer’s 1966 Impulse album, The Dealer, which revealed the Berry influence on the title track and the Wes influence on his mellow blues, “Larry of Arabia.” That same year he formed the psychedelic band The Free Spirits, in which he sang, played guitar and sitar, and did most of the composing. While the band’s music on its 1966 debut, Out of Sight and Sound, conformed to a psychedelic formula with titles like “Cosmic Daddy Dancer” and “I’m Gonna Be Free,” it foreshadowed jazz-rock fusion with more complex soloing by Coryell and saxophonist/flutist Jim Pepper. After performing on other seminal fusion albums by vibraphonist Gary Burton (1967’s Duster), saxophonist Steve Marcus (1968’s Tomorrow Never Knows), and flutist Herbie Mann (1969’s Memphis Underground), and gigging with the likes of Burton, Jack Bruce and others, Coryell established his multifarious musical voice as a leader, releasing two solo albums (1968’s Lady Coryell with Jimmy Garrison and Elvin Jones and 1969’s Coryell) that mixed jazz, classical and rock ingredients. In late 1969, he recorded the landmark album Spaces, which featured fellow guitarist John McLaughlin, keyboardist Chick Corea, bassist Miroslav Vitous, and drummer Billy Cobham. The participants would later form the ground-breaking fusion bands Weather Report, Mahavishnu Orchestra, and Return To Forever. Coryell further contributed to the fusion movement by forming The Eleventh House in 1973 (with Randy Brecker, Mike Mandel, Danny Trifan and Alphonse Mouzon), and subsequently released 1974’s Introducing the Eleventh House, 1975’s Level One and 1976’s Aspects. Switching from electric to acoustic guitar, Coryell recorded a string of unplugged outings during the mid ‘70s, including 1976’s The Lion and the Ram and two from 1977 in Twin House (with Philip Catherine) and Two for the Road (with Steve Khan), before becoming a charter member of The Trio with McLaughlin and Paco de Lucia in 1979. He later recorded solo acoustic versions of such classical works as Ravel’s Bolero (1983), Stravinsky’s Firebird Suite and Petruchka (1984) and The Rite of Spring (1986). Coryell’s varied musical expressions took him on a diverse journey, including collaborations with violinists Stephane Grappelli, L. Subramaniam, and Michael Urbaniak; guitarists Tal Farlow, Herb Ellis, Charlie Byrd, Laurindo Almeida, Sharon Isbin, Bireli Laurene, Emily Remler, John Abercrombie and Badi Assad; pianists Albert Dailey, Stanley Cowell, Kenny Barron, Mulgrew Miller, John Hicks, Kenny Drew Jr., and Cedar Walton; trumpeter Chet Baker; singer Mark Murphy, as well as the Brubeck Brothers, Charles Mingus (1977’s Three or Four Shades of Blues), and Sonny Rollins (1979’s Don’t Ask). In all, Coryell released more than 60 solo albums as a leader and more than 150 as a sideman. His most recent album, Barefoot Man: Sanpaku, was released on Oct. 14, 2016, on Cleopatra Records. He had completed a new Eleventh House album, Seven Secrets, which will be released by the Savoy Jazz label on June 2. Coryell’s final original works included operas based on Leo Tolstoy’s novels War and Peace and Anna Karenina, and James Joyce’s Ulysses. A life-long road warrior, Coryell toured internationally right up until his passing at age 73. He had planned an extensive 2017 summer tour with a newly reformed edition of The Eleventh House. He is survived by his wife Tracey, daughters Annie and Allegra, his guitar-playing sons and recent collaborators Murali and Julian, and six grandchildren. To celebrate the late tenor saxophonist Michael Brecker, who died on Jan. 13, 2007, from leukemia, several friends, colleagues and collaborators gathered at The Appel Room in the Jazz at Lincoln Center complex on Jan. 25 for the second “The Nearness of You Concert.” A fundraiser to support cancer research at Columbia University Medical Center and the work of doctors Azra Raza and Siddhartha Mukherjee, the event drew a packed house of dignitaries, including former President Bill Clinton, an avowed tenor sax player and jazz fan, and his wife, former Secretary of State Hillary Clinton, who attended the gala just five days after the Donald Trump’s inauguration. (Brecker had played at both President Clinton inaugurations in 1993 and 1997, and at a Hillary Clinton senatorial fundraiser in 2000). Co-produced by Brecker’s widow, Susan, and his longtime manager, Darryl Pitt, the concert featured performances by trumpeter Wynton Marsalis, jazz singers Dianne Reeves and Diana Krall, R&B diva Chaka Khan and the Saxophone Summit of Joe Lovano, Dave Liebman and Ravi Coltrane. Marsalis, who called Brecker “an exemplary hero of our music,” kicked off the proceedings with a burning rendition of the bebop staple “Cherokee” that had him trading rapid-fire eighths with drummer Jeff “Tain” Watts in a manner that recalled their fiery hookup from their days together in Marsalis’s “Black Codes From the Underground” quintet of the mid 1980s. Reeves next joined them for a balladic rendition of “Skylark” that never got off the ground. After four false starts, they scrapped the tune and improvised a blues that had Ms. Reeves scatting in an Ella Fitzgerald fashion. Before the Saxophone Summit tackled John Coltrane’s expansive “India,” Coltrane explained to the audience how his late father, John Coltrane, had a passionate interest in world music long before it became a genre. He also lauded Brecker as a mentor whose kindness, humility, and vision made him a beloved figure in the community of musicians. Krall delivered a sultry rendition of “The Nearness of You” (title track of Brecker’s 2001 Ballads album), with Lovano on tenor shadowing her vocals as Stan Getz did with Astrud Gilberto on 1964’s “The Girl From Ipanema.” The evening concluded on a high note with queen of funk Chaka Khan re-creating her version of Dizzy Gillespie’s “Night in Tunisia” (from her 1981 album What Cha’ Gonna Do For Me) and delivering a rousing rendition of the Beatles’ “We Can Work It Out” that had the entire cast of all-stars joining her on stage as the audience clapped along. On the way out, several high rollers in attendance could be seen writing checks for this worthy cause. Guitarist Bill Frisell with bassist Thomas Morgan and the great 83-year-old drumming master Andrew Cyrille at the Village Vanguard; Guitarist Jack Wilkins swinging standards with drummer Mike Clark and bassist Andy McKee at the Bar Next Door; Cooperative downtown quartet Omaha Diner (trumpeter Steven Bernstein, guitarist Charlie Hunter, saxophonist Skerik, and drummer Bobby Previte) radically tweaking pop hits from the ‘60s and ‘70s at the new venue American Beauty; Alto saxophonists Greg Osby and Jaleel Shaw joining with pianist Helen Sung, bassist Ben Allison and drummer Matt Wilson on interpretations of tunes by the great jazz pianist-composer Lennie Tristano; Drummer Jeff “Tain” Watts celebrating his 57th birthday with his quartet (saxophonist Ravi Coltrane, pianist David Kikoski, bassist James Genus, and guitarist Paul Bollenback) at the Jazz Standard; Sting sideman Dominic Miller performing spacious and lyrically beautiful tunes from his recent ECM debut, Silent Light, on nylon string acoustic guitar, accompanied by five-string electric bassist Nicolas Fiszman, in an intimate gig at Nublu the night before he played at the Hammerstein Ballroom with Sting.